Producer R.J. Louis wanted to do something special. For the kids. Louis was riding high after his movie The Karate Kid was the fifth-highest-grossing movie of 1984 and spawned a sequel two years later. But now the producer wanted to give back, specifically in a way to benefit people with disabilities and charities close to his heart. MAC and Me, a blatant reworking of E.T. starring Jade Calegory, a 12-year-old boy with spina bifida, as Eric and a rubber alien puppet as his best alien bud, MAC, hit theaters on August 12, 1988. The movie vanished two weeks later, grossing a meager $6 million. And R.J. Louis, who went on to produce Soldier, Vegas Vacation, and the Ocean's Eleven remake, would regard it as the sourest note in his four-decade career. "The movie was a heartbreak," Louis tells me over the phone. What happened? Blame fate, not McDonald's. The man behind MAC and Me approached altruism like any movie industry businessman might. By the mid-'80s, Ronald McDonald was the world's most famous person ("even more than Santa Claus," Louis observes). Steven Spielberg's oblong E.T. was close, after hauling in $435 million at the US box office. The producer, who worked on McDonald's campaigns during his pre-Hollywood advertising years and remained close to the Ronald McDonald House Charities, saw a Biblical opportunity. "It was time for another generation [to have its E.T. ]," Louis says, "so I came up with MAC and his family." MAC, Louis insists, stands for "Mysterious Alien Creature." The connection to his restaurant collaborator is coincidence. Louis spent three years bargaining for the movie and television rights to the McDonald's brand. He extolled his vision for MAC and Me to anyone and everyone at the company: Not only could there be a cardboard MAC in every McDonald's advertising the theatrical run, then pushing video cassettes when the time came, but the movie's profits would benefit the Ronald McDonald Children's Charities. "We became the first to really get into the business of selling product, movies through McDonald's," Louis recalls, a deal that would foreshadow Disney's decade-long cross-promotional agreement with the chain in 1996. "I'm still the only person in the universe that ever had the exclusive motion picture rights to the McDonald's trademark, their actors, their characters, and the whole company." 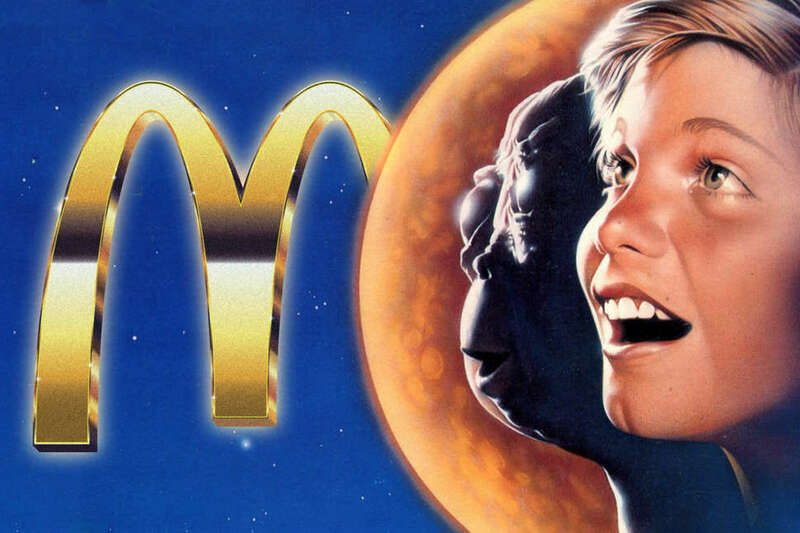 McDonald's didn't directly fund MAC and Me, according to Louis, though financing still came from within the family. During his hustle to obtain the restaurant's rights, Louis met Jim Williams, the president and CEO of Golden State Foods, a food processor and distributor that supplied meat, ketchup, lettuce, onions, and the secret Big Mac sauce for McDonald's franchises around the country. McDonald's was Golden State Foods' sole client, and when Louis pitched Williams on MAC and Me, the food maven saw an opportunity to give back. With money secured, Louis started the easy part: replicating the success of E.T..
With the right director, who needs a script? Stewart Raffill had experience with low-budget genre movies, finding success in the early '80s with the Star Wars popularity-siphoning The Ice Pirates and military-themed, time-travel movie The Philadelphia Experiment. Louis eyed Raffill because "he could deal with children, he could deal with animals, so he fit the persona that I needed out of a director." The well-intentioned charity hook of MAC and Me appealed to the director, so he signed on. As Raffill considered the requirements of working with alien puppetry and his disabled actor, Louis made sure MAC and Me would distinguish itself from its predecessor. "I was very careful to make sure that MAC did not resemble E.T," he says. Key differences included giving MAC a family (reunited at the end, in a court scene where the aliens are legally awarded immigration status -- seriously) and giving the main character special talents. MAC could ride a bike. E.T. could not. MAC could stretch across the windshield of a car like sentient glob of Gak. E.T. could not. Louis never met Steven Spielberg, but confirms his producer at the time, Kathleen Kennedy (now President of Lucasfilm), saw and approved of the finished product. Both Raffill and Louis say McDonald's offered only a few notes on the script. The director says MAC and Me needed to live up to McDonald's brand -- dress code, food code, fun image -- but the intention was to promote the House Charities, not the hamburgers (though Raffill says the company did provide lunch). There was just one nugget McDonald's insisted upon: Ronald McDonald shouldn't appear on screen. Except he did, and that was an artistic choice. 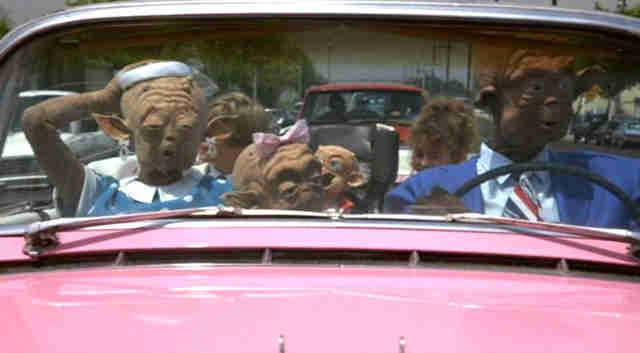 MAC and Me features 99 minutes of family squabbling over what to do with an alien (wacky! ), harmless action sequences involving two nefarious FBI agents, and reminders that hugs, smiles, and friendship are the foundation of positive living. But anyone watching the movie in 1988 could tell you that only two scenes would stand the test of time. The first is Paul Rudd's personal favorite. After catching MAC rummaging through his new home, Eric tries to catch the extraterrestrial critter -- and winds up ramping off a cliff in his wheelchair. Before he can drown in the lake below, MAC dives in and saves the day. Raffill shot the scene on at Malibu Creek State Park, which was owned by 20th Century Fox at the time. Jade Calegory actually performed the hill portion of the stunt himself. "We tried to make it as kinetic and energetic and have some physicality," Rafill recalls. Crew members took up positions to catch Calegory, and wheel stabilizers ensured he wouldn't fall too quickly, but there were still dangers. "It's very hard to do physical things when you're in that condition. It's very hard to make a wheelchair work, because it's not a very balanced thing. When you start going fast in a wheelchair, you place tremendous risk on the child, so you have to try and figure out how to do that in a controlled fashion." Then there's the dance sequence, a four-and-a-half-minute choreographed wonder that starts in a McDonald's parking lot before erupting in the middle of the restaurant, dance fever spreading through every casual Quarter Pounder-eater like it's Contagion 2: Electric Boogaloo. MAC, dressed in a bear costume, breaks on the ordering counter as cashiers provide back-up. Football players, 9-year-olds, and Ronald McDonald dance their hearts out. And in heartbreaking juxtaposition, Eric, confined to his wheelchair, weaves through the crowd. Why is this scene in the movie? Well, why not? "When I make a movie, I don't want to just make a movie," says Louis. "I want to make the movie revenues, the video revenues, I want to do a book, I want to do a soundtrack. That's why that was in there." Music supervisor Brooks Arthur, who worked on The Karate Kid with Louis, commissioned original tracks from R&B singer Bobby Caldwell and popular songwriting duo Ashford & Simpson to soundtrack the big moments (while Alan Silvestri of Back to the Future fame provided the score). Raffill and Louis were careful about product placement. You won't find gratuitous product shots in MAC and Me. Louis claims he wanted a scene set in a McDonald's only because, for kids of that age in that era, going to McDonald's was the ultimate treat. Raffill pushed to make it a musical moment to "imbue it with something richer." This was escapism, with Ronald McDonald as a Michael Jackson stand-in. "The key is I want to make a feel-good movie," Louis says, "you walk out and you're feeling good and you had fun." MAC and Me's problem was getting people to walk in. Louis says he had offers from big studios like Paramount and MGM after test audiences rated the movie more favorably than Tootsie -- one of the most successful comedies of all time. Conversations with investors put the film at Orion Pictures, known for everything from Amadeus to Back to School. But a silent stakeholder battle between billionaire John Kluge and media mogul Sumner Redstone left Orion wayward in 1988, and according to Louis, MAC and Me suffered collateral damage. The movie only made $6 million in two weeks against competition like Who Framed Roger Rabbit, Big, and Die Hard. "McDonald's didn't really get behind MAC and Me as much as the producers expected," Rafill recalls. 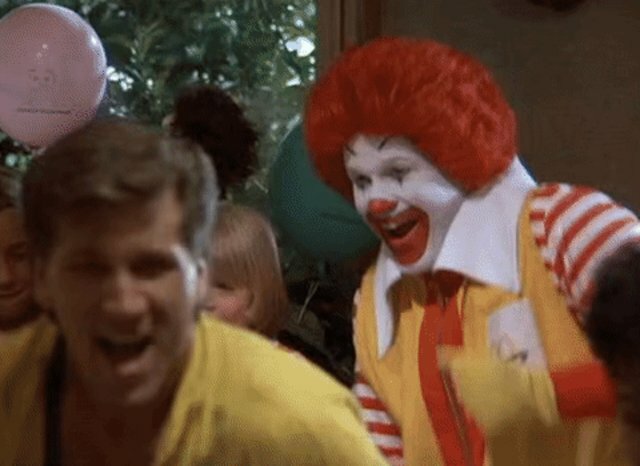 Commercials featuring Ronald McDonald shilling for the movie struck the wrong chord, the charity obscured by product placement. The promotional rollout Louis conceived in the beginning were cut short thanks to bigger studios' newfound interest in cross-promotion. Still, Raffill remains baffled about the critical response and subsequent box office numbers. "Nobody picked up on [our casting of a disabled actor as a lead]," he notes. "America's usually a very charitable country in that respect. It was a bit bizarre." 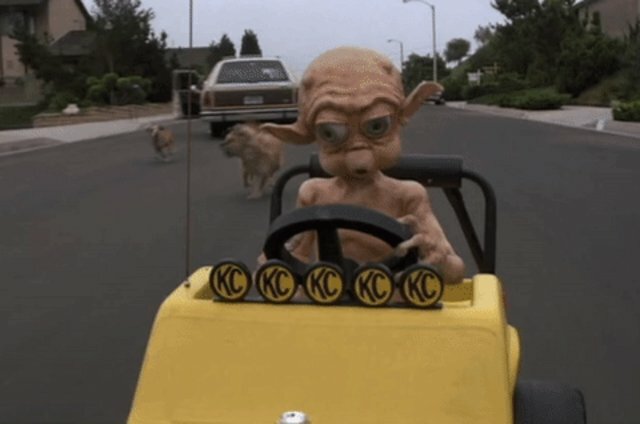 Louis believes there's a future for MAC and Me -- and it has nothing to do with millions of YouTube views or Paul Rudd's devotion to the movie's outsider art potential (in fact, neither Raffill nor Louis knew of Rudd's prank when I spoke to them). 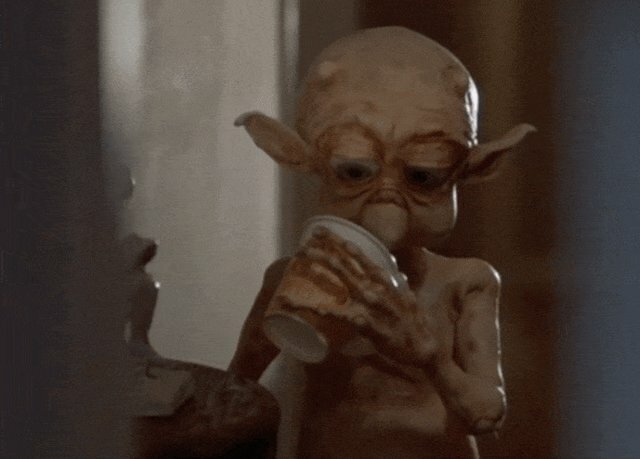 The producer maintains there's genuine interest in MAC and Me because the video sales made the movie profitable for Orion, and that the second coming of that not-quite-E.T. alien would connect with today's kids. Plus he made a promise. As he reminds me, the last shot of the movie sees Eric, MAC, and the alien family driving a pink convertible down Hollywood Freeway. A speech bubble pops out of the car: "We'll be back." Don't expect the alien fam to pick up drive-thru: McDonald's won't play a role in any MAC sequel, says Louis. This MAC fan can only hope Burger King comes to the child dance community's rescue.